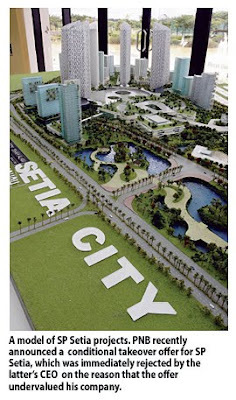 KUALA LUMPUR: The major shareholders of SP Setia Bhd have appeared to patch up their differences, after a joint statement by both the property developer and Pemodalan Nasional Bhd (PNB), say analysts. 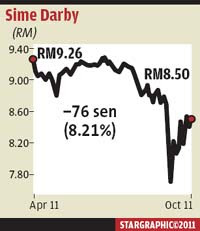 This has also meant that SP Setia chief executive officer (CEO) Tan Sri Liew Kee Sin is now less likely to seek a higher takeover bid. "Market talk was that PNB and Liew did not see eye to eye on some issues, particularly on PNB's intention to have more say in the company. The statement yesterday certainly squashed market rumours and addressed the concerns of investors, employees and business partners. "With the statement, it is also less likely that Liew will be seeking for higher bidders, as this may not look professional," said a research head from a local brokerage. Early this week, PNB in a statement, said it wants Liew to remain at the helm of SP Setia and the existing management team to continue to manage the company. It added that "it is committed, once markets stabilise, to maintain an appropriate shareholding spread with the capacity to attract not just local but also foreign institutional funds and retail participation". Liew, in the statement, added that he was "heartened" by the reassurance from PNB president Tan Sri Hamad Kama Piah. To recap, about two weeks ago, PNB announced a conditional takeover offer for SP Setia, which involves PNB buying SP Setia shares it does not own for RM3.90 a piece and warrants it does not own for 91 sen each. The takeover bid, which appears to be hostile, was immediately rejected by Liew on the same day, saying that the offer undervalues the company. He asked PNB to reconsider higher offer and said it will seek offers from rival bidders. The takeover is conditional upon when PNB receives more than 50 per cent of shareholders accepting the offer. Since PNB's announcement, the group has increased its shareholding from about 33.2 per cent to about 38 per cent in SP Setia, mainly via the open market. However, interestingly, it appears that PNB's acquisition from the open market has slowed lately. 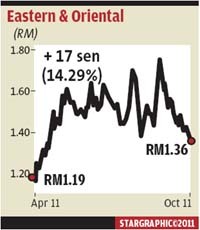 This week, SP Setia's average daily trading volume is about one million shares a day. In contrast, between September 29 and October 7, its average trading volume was 15 million shares a day. "It is now likely that investors will just sit out for the time being while waiting for the independent advice circular to be out," said an analyst. PETALING JAYA: Construction and integrated property developer and manager Sunway Bhd has been awarded a contract worth RM308.9mil from Iskandar Malaysia Studios Sdn Bhd for the construction of an integrated media studios facility in Johor Baru. In a statement to Bursa Malaysia, Sunway said that its wholly-owned subsidiary Sunway Construction Sdn Bhd had received the letter of award for the project. Called Pinewood Iskandar Malaysia Studios, work on the project would take 19 months for completion by May 10, 2013. Among other things, the project would comprise a TV block, with two TV studios and two scene docks; a film block with five studios; an annex block with a viewing theatre and audience-holding area; a production block, with offices, dressing room and wardrobe studio; and ancillary building and space, with a guard house, carpark and a 10-acre backlot for filming. The project is expected to contribute positively to the earnings of Sunway group from financial year ending Dec 31, 2012 onwards. In a separate announcement, Sunway said that Sunway Developments Pte Ltd, together with Hoi Hup Realty Pte Ltd and Oriental Worldwide Investments Inc, had been awarded the tender for a piece of land in Jalan Loyang Besar/Pasir Ris Rise, Singapore for a 99-year lease term at S$140.96mil (RM345mil). Sunway Developments, a wholly-owned subsidiary of Sunway Construction, would set up a joint-venture company with Singapore-based Hoi Hup and Oriental World based on a 30:60:10 equity ratio to undertake the development of the land. The proposed development is expected to complete within 60 months, commencing Oct 10.